Dining in Crested Butte is ALWAYS great! Michael Carlton of The Denver Post once said "Crested Butte has more fine dining restaurants per capita than any other town in the U.S.". Whether you crave a burger, sushi, elk tenderloin, steaks, seafood, or just relaxing with a unique cocktail, Crested Butte Dining won`t disappoint. 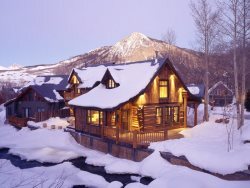 Winter in Crested Butte is nothing short of magical! There are a variety of activities to keep you busy while Jack Frost is knocking at the door. Visit Crested Butte and breath the Rocky Mountain air as you enjoy a variety of fun activities in the warmer months of summer and the comfortable temps of fall. For family fun, look no further! Crested Butte is the perfect place to make lasting memories while the kids are young.